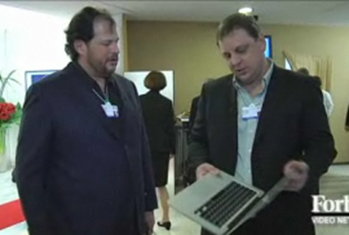 Watching Salesforce.com CEO Marc Benioff interview Mike Arrington @ Davos in January, I predicted the Big Marc was after a new job in media. It all felt confirmed when Benioff launched a series of posts at TechCrunch (although I suspected a fellow XXXXX blogger wrote his posts). But now it looks the other way around: Benioff stole TechCrunch contributor Steve Gillmor. Strange. But I could still be right. Here’s my conspiracy theory: it’s a job swap. Gillmor will soon take over as CEO while Big Marc will retire to his Hawaii Mansion to lazily edit TechCrunchIT.